South Africa is the third most biodiverse country in the world. For millennia, this bountiful natural heritage has sustained our people. It provides essential ecosystem services on which development is based. Well-functioning biodiversity contributes to livelihoods, human health and well-being, and food and water security. Sustainable maintenance and use of biodiversity can contribute to our efforts to eradicate poverty and create economic opportunities for our people into the future. Conserving and managing biodiversity in priority areas through voluntary agreements with communal and private land owners, known as biodiversity stewardship, is an important approach to secure land in areas of high biodiversity importance. 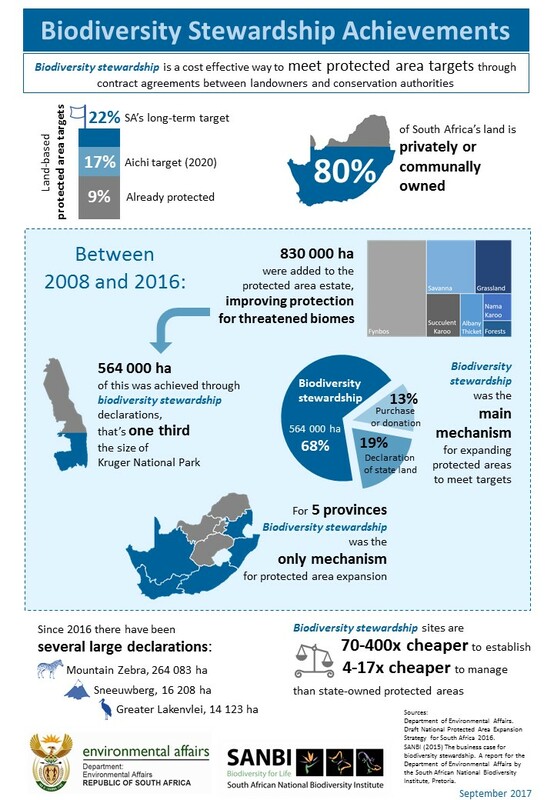 Biodiversity stewardship is a cost effective way to meet national protected area targets through contract agreements between land owners and conservation authorities. 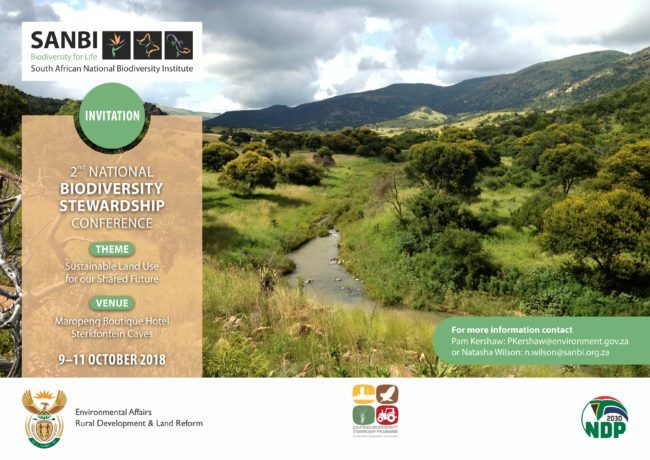 The 2nd National Biodiversity Stewardship Conference brings together over 100 delegates representing national, provincial and local government departments, community beneficiaries, non-governmental organisations and academic institutions to engage, to learn, to share their success stories and their challenges. The conference provides a platform for identifying emerging opportunities that can help to address the social and economic challenges of the country; and aims to enhance the implementation of biodiversity stewardship, unlocking its contribution to the country’s development agenda and promoting sustainable land use. Conservation, development and academic experts will convene to deliberate on mechanisms to bring about tangible benefits and secure financial solutions to the stewards of biodiversity. Under the theme, ‘Sustainable land use for our shared future’, and in collaboration with various partners, the South African National Biodiversity Institute (SANBI), the Department of Environmental Affairs (DEA), Endangered Wildlife Trust (EWT) and Gauteng Department of Agriculture and Rural Development (GDARD) will be co-hosting this conference from 9 to 11 October 2018 near the Sterkfontein Caves. Our natural inheritance is precious and fragile, and, therefore, as the country strives to develop the economic potential of its natural resources, it must do so sustainably. Biodiversity stewardship an important mechanism for encouraging sustainable development. For updates and news of the 2nd National Biodiversity Stewardship Conference follow SANBI on Twitter @SANBI_ZA.